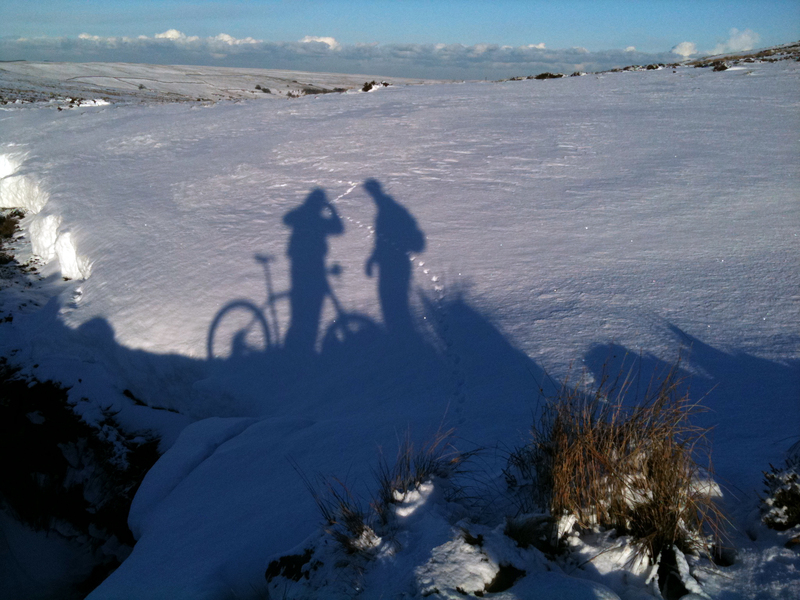 Craig and I set out from Kildale in a sub zero temperature. 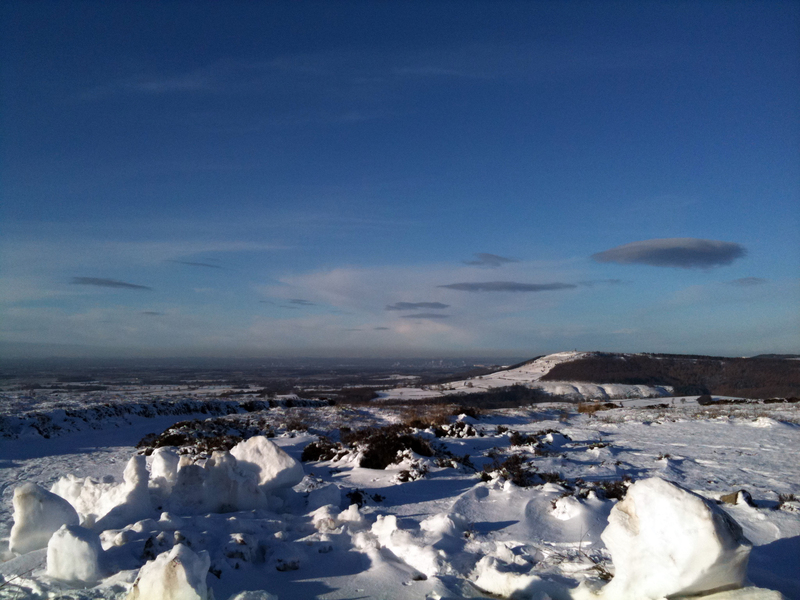 The snow fall here in the NorthYorkshire Moors was more imposing than we might have imagined, but sun shone in a crisp blue sky and we were encouraged to make the most of it. The road from the station in Kildale was dangerous at best, as all water was frozen solid and lay like thick glass forcing us to the side of the road in search of some grip. The Cleveland Way was at least distinguishable, toughened heather lined the trail to let us know were still on course. As we gained height we arrived onto a Christmas card which where normally seen features were covered made reading a map an almost pointless task. I was glad to have transferred the route to the GPS, which really did serve its purpose on this ride. Some walkers had been out before us and their footprints served as a quick guide to where the trail was heading. We did have to check a few times though and occasionally found we were about to head off course when one of use would disappear over the bars or fall through deep snow into a beck. There were a few rapid dismounts too. Red grouse gave us the archetypical moors scene that invoked a sudden graving for whiskey, and figured we’d have enjoyed a hip flask over the camlebak. The low sun cast long shadows over the snow covered land only broken by heather and a few forest plantations, but served as a good opportunity to cast some amusing silhouettes. We’ve both clearly grown up and moved on from bunny ears. Craig and I tried to muster some speed from the ride where the route descended. No longer had we started to feel like we were making some progress snow drifts would grab the wheels and bring us to a grinding halt. Our tires were dry because the snow appeared like salt which indicated the extreme low temperature. 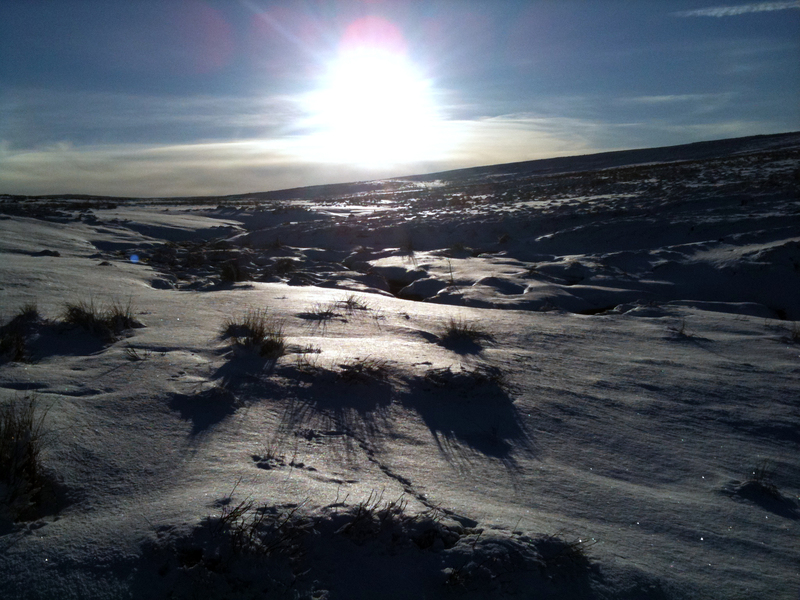 The hardest part though was the technical gully across Great Hograh Moor that had completely frozen over. 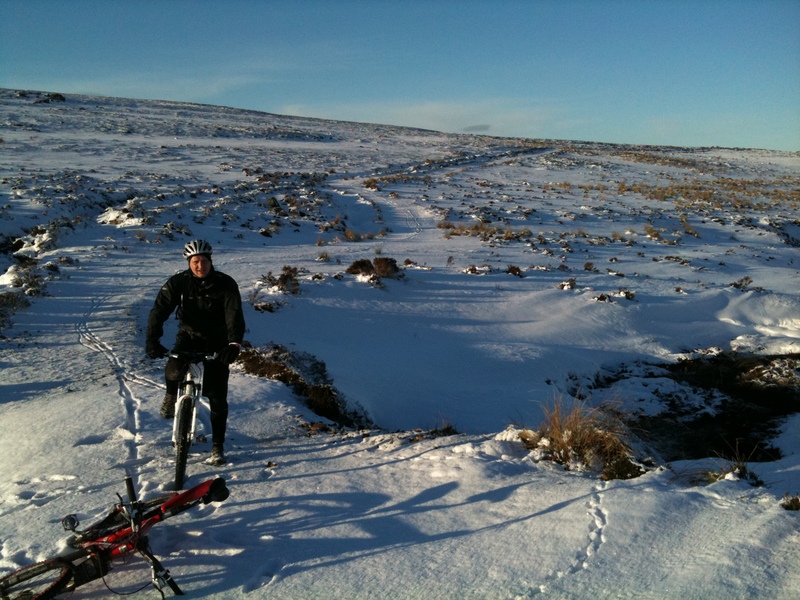 This would have been a difficult section in the summer but now a deep vein of solid ice which forced us to ride on the heather criss-crossing the gully as we confronted frozen ice pools. We pushed and carried between the rideable parts of the trail until we reached tarmac. From Westerdale and dropped steeply on hard snow and ice to the ford. 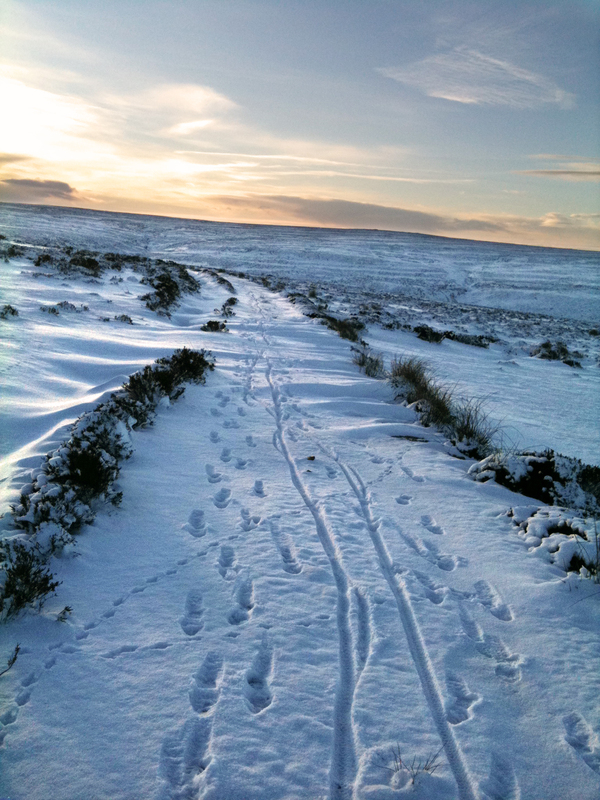 The sun had dropped now at around 16:00 and the next section of trail across Baysdale Moor would no doubt slow us down, it was getting late. We agreed to take the road back to Kildale, only three miles. The moon shone brightly and just as well it did as darkness feel swiftly around us as we climbed steeply from Baysdale Beck. Along the way we encountered an IKEA truck that had slid off the road obviously trying to descend slowly no doubt an over dab of the brakes lead the yellow lorry into the ditch. A rescue attempt took place, by a few local blokes using another wrecking lorry and lots of grit. We peddled past consumed with our own mission which was to avoid being rescued ourselves. Signs off the freezing conditions were everywhere asking us to reflect on what it must take to live in such rural isolation. Craig showed some spirit, his hands frozen was also carrying a touch of cramp, probably due to a lack of fluid, our Camlebaks were now iced solid. We completed the ride with virtually no water; fortunately Craig had energy bars and fruit pastels. Since this experience Craig learned from James Bond I think, said that it was easy to overcome the freezing camelbak problem which to simply blow a breath of air back through the tube forcing water back into the bladder. The tube has no water in therefore will not freeze. Fiendishly clever! We were fortunate not have any wind against us. In fact in most parts there was no breeze at all. Had this not been the case, then this would have turned out to be more of an expedition than a quick blast in the moors. We were pleased to get back to the van and we have not stopped eating since. We’ll have to give extra consideration to the next ride unless we see a good thaw.